Unstuck Joy! with Vicki Todd - The Art of Living On Purpose: Retrain Your Brain and Live Unstuck JOY! Did you know 95% of our thoughts are the same as the day before because we’re living life in subconscious, default programming? And, 70-80% of those thoughts are negative, limiting, disempowering, and sabotaging! Tune-in to Unstuck JOY! The Art of Living on Purpose with Vicki Todd as she shares how you can retrain your brain to match your positive dreams and desires! 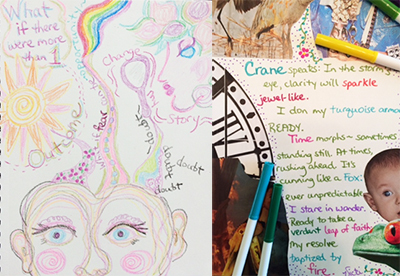 Vicki and Dr. Pat will invite YOU to play along with Vicki's Art Visioning process – a fun, creative, transformative spiritual process of using simple art journal prompts to discover your True Self and live Unstuck JOY! This show’s prompts of Retrain Your Brain and Collage Poetry will help you discover how you can consciously choose your thoughts and feelings and create more abundance! Are you using conscious, deliberate, positive OR subconscious, default, negative “voices” during your day? Create your Future Self = match positive thoughts + authentic feelings + gratitude to create new YOU and lead to new actions and abundance/Unstuck JOY!